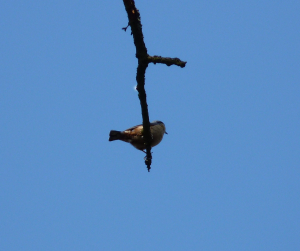 Observation - Nuthatch and its home - UK and Ireland. Description: Small grey bird with pale underside near its nest hole which was made smaller with a ring of mud, high up in an oak. Small grey bird with pale underside near its nest hole which was made smaller with a ring of mud, high up in an oak.